As a sign painter I typically designed the signs I was to paint, beginning with "thumbnail sketches" and ending with the finished layout, often produced as a "pounce pattern" (an actual-size drawing on paper, traced over with a perforating wheel, then transfered to a signboard or other surface by dusting with a suitable powder). Shown here on the left, drawn on my early letterhead for a client's approval, are ink silhoutte designs for large plywood cutouts to be mounted on his horse barn. 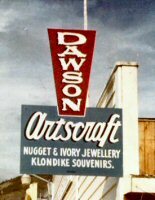 At right is a typical production from my later sign shop in Dawson City, Yukon, 1976.